Smear-ripened cheeses (also known as bacterial surface-ripened cheeses, washed rind cheeses and red smear cheeses) are characterised by the development of a very complex adventitous red-orange bacterial surface microflora during ripening. Most such cheeses as soft although a smear microflora is encouraged to grow on the surface of a few hard or semi-hard cheeses also (e.g., Gruyere de Comte), although in these cases the contribution of the surface microflora to ripening is relatively small. 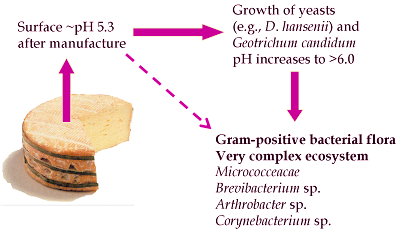 After manufacture, a range of halotolerant yeasts (often of genera including Debaryomyces, Saccharomyces and Candida) together with Geotrichum candidum become established on the cheese surface where they metabolise lactate causing an increase in pH. This change in the environment favours the growth of Gram-positive organisms such as Micrococcus, Staphylococcus, Corynebacterium, Arthrobacter, Microbacterium and Brevibacterium. (Older sources generally mention Brevibacterium linens as the principal smear organism but more recent work has shown that this is only one organism amongst many.) The surface microflora may reach 10^11 cfu/cm^2 and has a huge effect on the development of cheese flavour. Although enzymes essentially do not diffuse through cheese curd, small volatile flavour compounds produced by the surface smear do move into the cheese. During ripening, the cheese surface is "smeared" (traditionally by hand using a cloth soaked in brine) to discourage bacteria growing as colonies and to favour a more uniform surface. 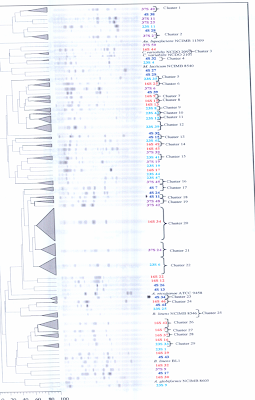 The bacterial surface microflora is extremely complex; the figure below is a dendrogram showing strain identification (by RAPD-PCR) of isolates from a smear-ripened cheese. Brennan, N.M., Cogan, T.M., Loessner, M. and Scherer, S. (2004). Bacterial surface-ripened cheeses, in, Cheese: Chemistry, Physics and Microbiology, Volume 2 Major Cheese Groups, 2nd Edn., P.F. Fox, P.L.H. McSweeney, T.M. Cogan and T.P. Guinee (eds), Elsevier, Amsterdam, pp. 119-225.